Over 3,000 software applications have attempted to dethrone the spreadsheet as the dominant work tracking tool within businesses large and small. And, for the past two decades, Excel has retained a crushing market share. I’m not talking about financial modeling or data analysis (those primary functions for which it was designed), I’m referring to the lists and plans we manage in spreadsheets strewn across email folders and computer directories. During 6 months of dedicated surveying of colleagues past and present, 9 out of every 10 answers to “How do you keep track of the work you are doing?” was email and spreadsheets. Responses came in from businesses large and small, across every role and title (Founders at startups, Microsoft marketing managers, Oracle sales execs, T-Mobile hiring managers, Non-Profit program directors, executive virtual assistants, and on and on…). The next logical question was, “Why?”. The answers to this open ended question were amazingly consistent. Next, I asked whether they had tried more sophisticated, purpose built tools for work management. Over 70% had done so within the past 18 months. The majority had defaulted back to their spreadsheets for the following two reasons. And these were the winners by a very, very wide margin. However, as business matures, time and productivity pressures press harder for more sophisticated solutions to parts of the business. And, over time we see the introduction of specialty tools. By genericizing the functions of the business, we can demonstrate how companies accumulate a stable of software solutions, and ultimately a deeper dependence on their I.T. and Accounting departments for the successful maintenance of their productivity tools. In this example Quickbooks takes over the accounting functions, and Salesforce is implemented for sales opportunity management. Then, in the mature phase, the functions of the business utilize the most cost effective tools for their areas of responsibility. Ultimately most companies accumulate a smorgasbord of business applications. With the power of automation comes the headache of software configuration, training, integration, maintenance and compatibility. It should come as no surprise that even the most sophisticated companies default back to the workhorse spreadsheet in some departments to escape the overhead of the tools intended to increase productivity. 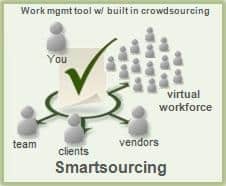 Why is it that a tool like a spreadsheet can perform so ubiquitously across so many work tracking functions, yet no software vendor has yet built the one size fits all for the front office needs in a fashion that mirrors how people want to work? Quickbooks has nearly accomplished it for the small business BackOffice. Then again, they’re generally serving the needs of only one or two users, whereas the spreadsheet crowd is composed of a variety of different personas. Our Opportunity is to intercept the small business managers before they sign up for the expensive, complex tools and outfit them with a one-size-fits-all solution that gives them everything they like about their tool of choice (spreadsheets), and gives them all that they are missing to make it a great experience without I.T., without setup, and at a cost that starts at $10 a month. In no way am I implying that our approach will do all the things possible in each of the specialty software packages. But, after 15 years, and 1,500 companies worth of IT systems observations, I know without a doubt that very few people actually use them anyway.